For bbq sauce: in a small saucepan on medium heat combine the brown sugar, ketchup, mustard, water, chili powder, liquid smoke, onion powder, garlic powder, salt, pepper, and cayenne. Bring to boil and then reduce to a simmer, stirring frequently. In a large skillet heat the oil olive over medium heat. Add the onion and cook until soft, about 5 mins. Add the garlic, jackfruit, and 1/4 cup bbq sauce. Cover and let cook for 10 mins or until easy to break apart. Mash with a potato masher until it resembles pulled pork. Mix in 1/2 cup bbq sauce. Spread the mixture on a parchment lined baking sheet and bake for 25 mins or until the edges begin to darken. While the jackfruit is cooking prepare the jalapenos. Cut each pepper in half and remove the seeds and membranes. Mix the vegan cheese into the jackfruit. Fill each pepper with the mixture. 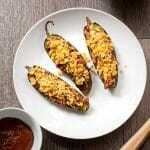 Place the peppers on a baking sheet and bake for 15-20 mins or until the cheese is melted. Brush the top of each pepper with the remaining bbq sauce and sprinkle with the broken tortilla chips. Make sure you get young green jackfruit, not the sweet kind packed in syrup. It’s a good idea to use rubber gloves while handling hot peppers.